Developing healthy eating habits isn’t as confusing as many people think. Healthy eating is about eating smart and enjoying your food. It is also about being consistent with your health choices. While we may not always be perfect, by focusing on changing some of your daily habits, you can improve your overall health and lower your risk for certain diseases. Your top priority when moving towards a healthy lifestyle should be achieving optimal hydration levels. It is not just about getting a few glasses in a day, you should be focusing on having around 500ml every hour or two, consistently throughout the day. Cutting out other forms of high caloric fluids will come more naturally when you begin to focus on proper hydration. Stick to consuming as many natural foods as possible. We have been nourishing ourselves with fruit, vegetables, nuts, seeds, beans, lentils, whole grains and meats for thousands of years. Not all calories are equal! The body prefers to breakdown what it knows. 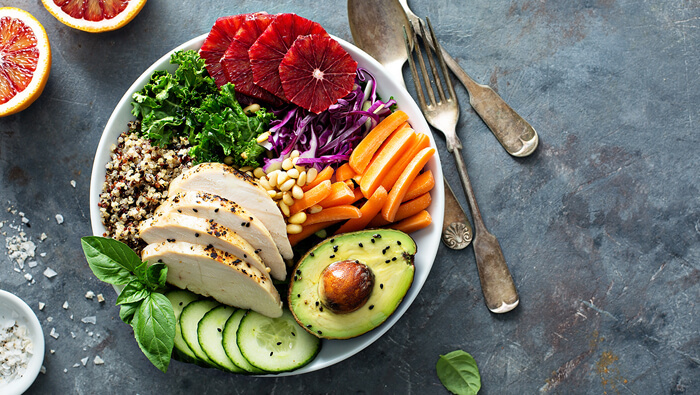 Building your plate with greens, reds and yellows will support a nutrient dense meal that will fuel the body better for workouts, muscle recovery and promote weight loss. When you begin to consume foods without labels there is no reason to count calories! In one sitting, the most your body can absorb and use is 30g of protein for muscle growth. Anything more is simple extra calories. If you are looking to increase muscle, aim for 30g of protein at each meal and in between snacks. If you are looking to maintain, consuming around 20g-25g protein at breakfast, lunch and dinner will support healthy lean tissue! Remember that protein is not only found in animal products. Beans, lentils, legumes, whole grains, nuts and seeds all contain good amounts of protein. Tip: 4oz of animal meat is 30g protein! Be mindful the next time you are at a steakhouse – keep the rest for left overs! Ideally the timing of carbohydrates will be mostly around training and activity. The body uses the energy from carbs (glycogen) when engaging in activity. Sticking to low carb intake during times of inactivity will support weight loss or maintenance and improve energy levels. Tip: Avoid simple carbohydrates and sugars as much as possible. I like to refer to them at dead foods, as they do not provide much nutritional value at all! You need a healthy consumption of fat every day to maintain cell structure and the overall health of your body. Healthy fats will help to keep you feeling full and satisfied, preventing over eating and may help reduce cravings supporting weight loss and healthy weight maintenance! Tip: When consuming dairy, stick to the full fat options. When you take away the fat, you take away a lot of flavour that is most likely replaced with sugars and chemicals. Stay away from the trans fats – they have been found to be the main cause of blocked arteries. Remember to focus on the consistency of your health choices, not perfection.